Lakefront villa on Lake Atitlan, one of the most beautiful places on earth. Enjoy views of three volcanoes from our three bedroom home in this eco-tourism wonderland. Relax in a peaceful, safe environment far from noise and city distractions. Close to tranquil Mayan villages where you can shop for authentic weaved goods and learn about Mayan culture. Our home is equipped with cable television, fireplaces, a full kitchen, dishwasher, clothes washing machine and dryer. The house has a private dock and lakefront, as well as a spacious yard with avocado and banana trees. Enjoy a private massage, have a meal prepared for you at the house, take Spanish lessons, climb a volcano, shop for handmade textiles and crafts, relax. We have a fulltime caretaker who can pick fruit for you or help with errands and a local property manager who speaks English and can help with anything you need. The house has a large master suite, a second bedroom with a full-size bed and a third bedroom with two double beds. Each of the bedrooms has its own private bathroom with a shower. But don’t miss our favorites: the outdoor shower on the master suite’s side balcony and the “volcano-view” bathtub in the master suite’s bathroom, which we designed on an elevated platform so you could take a bath while looking out on the magnificent view of three volcanoes: Atitlan, Toliman and San Pedro. The house was built by local craftsmen and the stonework was done with stones from the property. Check out the gorgeous wall in the downstairs hallway. The house is very private. It's located outside of any village, so it's very quiet. There's also no road-access to the houses so no car traffic noise or pollution, which can be an issue in some parts of Guatemala. The house is directly on the boat taxi line and the drivers can drop you off and pick you up. If you have a car, there is a very inexpensive pay parking area - with 24-hour security - at the boat taxi launch dock in Panajachel. WiFi is available for a small daily fee paid directly to the provider. Master bath has outdoor shower and jacuzzi tub with volcano and lake views. On main floor and in master bedroom. Available upon request from a local provider. Usage fee paid for by tenants. My family of 5 (my husband and I, & our 3 young children) just returned from spending a week at this wonderful house on Lake Atitlan & can't say enough about it. The house is a little more rustic than the pictures show, but the charm is ALL there & it's a gorgeous property. It's near the very small village of Jaibilito. You take a launcha (water taxi) from Panajachel (Pana) and will reach the house in approx 10mins. This is one of the most quiet places on the lake. Beautiful, warm days and cool, breezy nights. No AC (standard for Guatemala so take in consideration for the season you are traveling), but doors/windows open (they have screens) and the cool air along with the sound of lapping waves lulled us into the most tranquil sleep each night. Anastacio, the grounds keeper, is probably the most outstanding "asset" to the house. He's there every day (you'll see him around the property typically pretty early - 7:30am or so...you'll be up with the sunrise anyway, so you'll be on your 2nd cup of coffee by then;). Anastacio speaks a fair amount of english, but if you don't know spanish, download google translate before you arrive! He is your right hand for ANYTHING you need. He can set up private boat transfers around the lake, excursions, etc. He might even go along with you if you want him to! We really acquired a special fondness for Anastacio. He's truly a great man. Hire Maria to cook for you!!! She is AMAZING. She can make anything, but we asked for traditional fare and had the most stunning and delicious meals, and again - formed a great relationship with her and her young daughter. We will miss them! Needing some Spanish speaking skill is true for most of Guatemala - at least a basic amount of Spanish to get by or you will really struggle, especially in the smaller villages. Panajachel has the most amount of tourists/english speakers. Note that you are in nature and you will see bugs. A few spiders and a couple of scorpions are common, but they have NO DESIRE to be around you. We were timid at first, but by the end of the week,even my small kids weren't bothered at all. The house has everything you need (except an iron/ironing board, but come on - who cares!). Go to the "Super Mercado" in Pana for groceries before heading to the house. No grocery store in Jaibilito. We hated to leave. Truly. My 7 year old cried for two hours the day we left because he didn't want to go. It's a special, special place. Has our hearts. We'll be back!! I love the design of this house. Solid, well thought design, equiped with all the necessary for a pleasant comfortable stay. 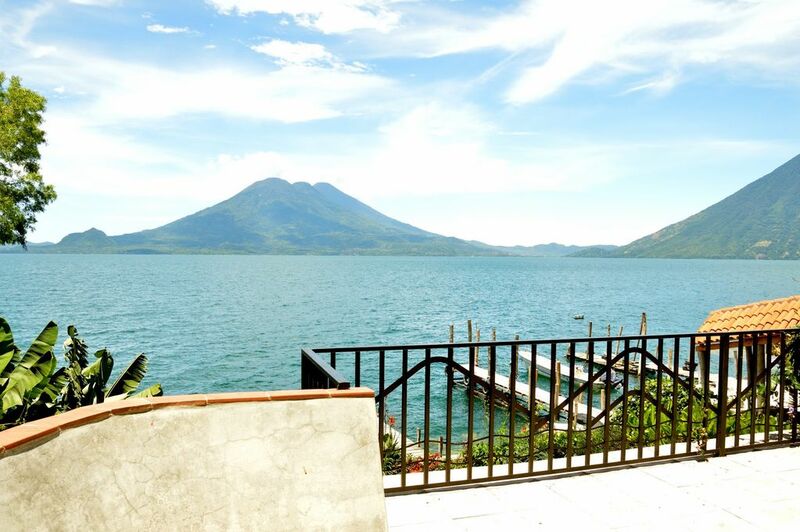 The house is well appointed and has magnificent views of the three volcanoes on Lake Atitlan from all levels. All bedrooms were comfortable with the large main bedroom on the whole top floor particularly spectacular. Transport by boat was easily arranged - we had the advantage of a Spanish speaker in the party. The Spanish speaking caretaker was very helpful. Jaibalito can be reached on foot in about 10-15 mins. I would thoroughly recommend staying there and we wish we could have stayed for much longer. Thanks for a great holiday experience . Amazing views of the volcanoes and Lake Atitlan. House is beautiful, clean and care taker Anastacio was wonderful and accessible to whatever we needed. We so enjoyed our stay and felt very taken care of. My advise is that you load up on groceries at Panachel, they now have a beautiful large grocery store, but be sure to pick up napkins or paper towels, and additional toilet paper, coffee or tea and garbage bags. As their kitchen is stocked with essential hardware, but not any other pantry essentials, besides salt. As recommended, we brought candles in case of an electric outage, we did not need them, but there were no extra candles in the home. Loved our stay at Casa Tres Volcanoes and be sure to do a lake tour and visit all the other villages, Santiago, San Juan and San Pedro, as well as the Iguana Hotel in Santa Cruz. You can hire a private boat for the day and see all. My nephew lives in Antigua and was our tour guide and interpreter for our stay, if you do not speak any Spanish, it could be a challenge! Amazing trip! Beautiful and quiet home with an amazing view! Christmas/New Year's rate is $1,000 per week.